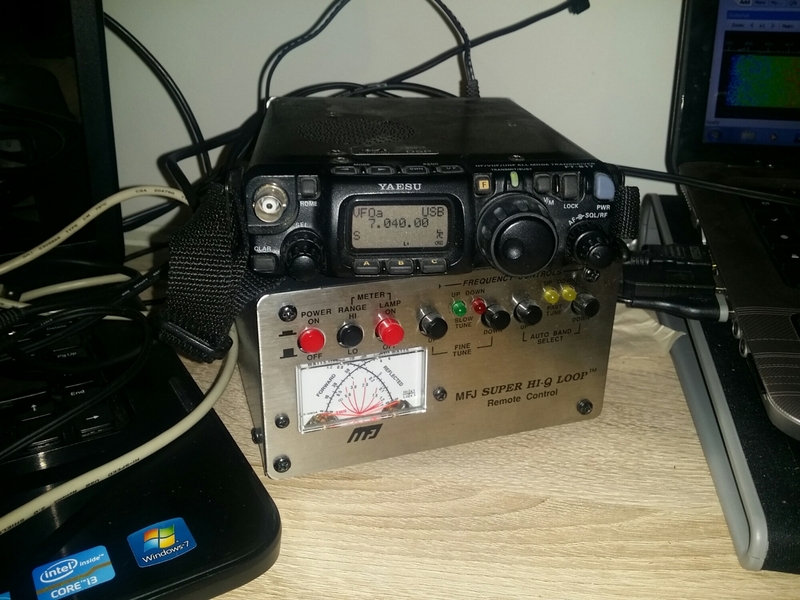 Can’t sleep, but done some Ham Radio stuff recently so about time for a brief update. 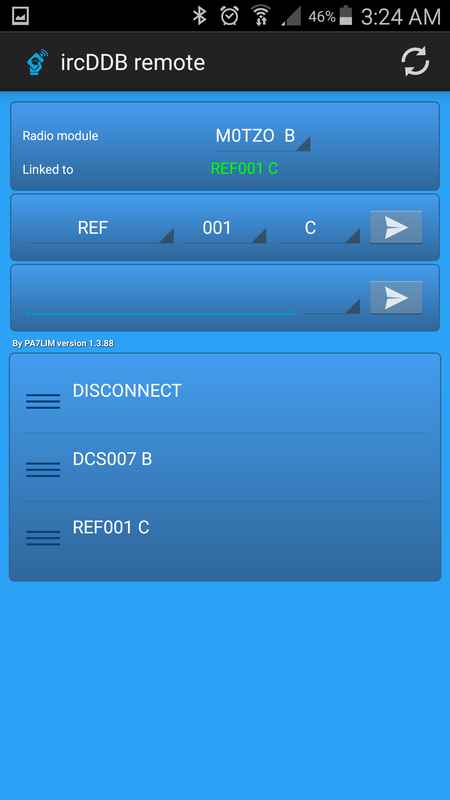 This is a screenshot from my Raspberry Pi 2 (B) running VNC on my Android phone. This Raspberry Pi runs my Flightradar24 software using a cheap USB TV stick and my Ham Radio Digital Voice Access Point (DVAP) Dongle (70cm). I’ve recently upgraded the Raspberry Pi (& others I have) to the new Raspbian with Pixel desktop and the G4KLX D-Star software was checked for updates which runs the DVAP mentioned above. I’ve also setup on my iPad and Android phone is the ircDDB remote software. It makes switching reflectors so much easier than programming on the handheld. 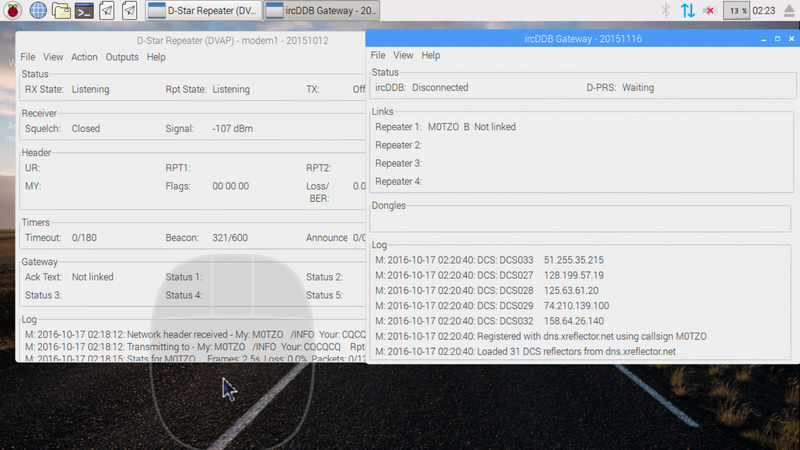 The above screenshot was taken while connected to the International D-Star net run weekly on Monday 1am local UK time, Sunday 19:00 (CDT), Sunday 00:00 (UTC). This week I didn’t check in, but heard stations from USA, Japan and Australia. 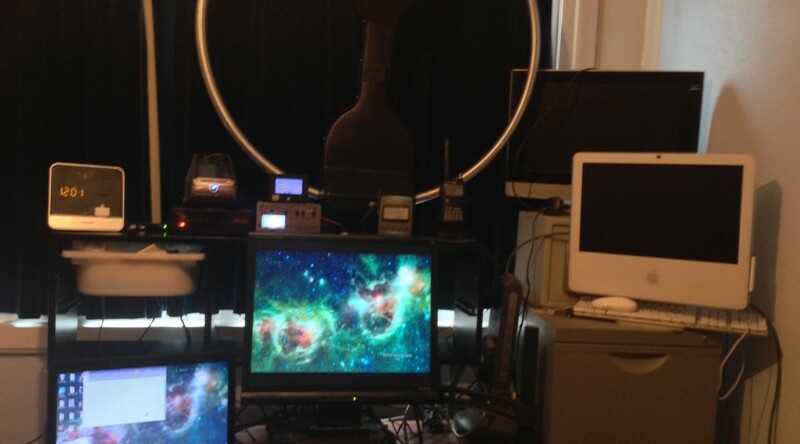 I’ve finally sorted out a setup so I can operate from home. I know it’s been a while, 18 months from my reckoning. On Sunday after returning from a nice coffee locally I thought was time to sort my antenna and radio out. I collected from the garage my MFJ 1788x and the speaker stand I have for it and setup in the bedroom. 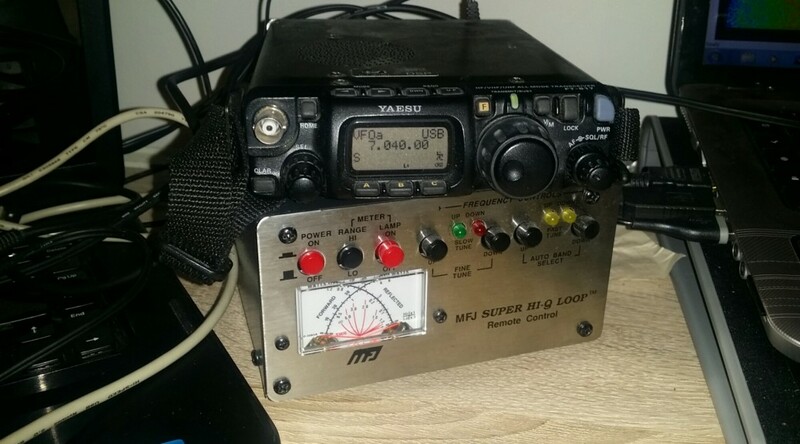 I soon had it setup and decided that between my Yaesu FT-897D and FT-817ND the latter would be better due to space issues on desk for now. After much cursing I gave up on HF, and setup my small 2/70cm antenna and was working a couple of stations through a local repeater GB3NS about 7 miles North of me. Thanks to M3NLN and G6LTT. The HF tuning issue I’ll look into tonight, but I suspect I had the old curse of the 2 antenna sockets to blame and believe I was on the front socket in error. I’ll hopefully know this evening. I decided before Christmas on a change of plan. I sold to a friend (who is probably more adept at using the parts I got) the kit I had collected. I then brought eBay a SainSonic AP510 which has the following features:- APRS Tracker VHF with GPS, Bluetooth, Thermometer, TF Card Support & use with APRSdroid. So far I’ve used both modes and find the 1w on the built in function can be limited, but using with APRSDroid while not using RF is more likely to work. This may be down to not many iGates to receive APRS data near me. Right, that’s enough for now I’m off for another walk being tracked on APRS too. Earlier in the year I attended the EMF camp ( https://www.emfcamp.org). Since attending I’ve been chatting to some of the Amateur radio operators ( https://wiki.emfcamp.org/wiki/Villages:Amateur_Radio ) who attended. One of the topics of discussion was about a project for the next camp in 2016. APRS seems likely and as I’ve still not got my GF radio setup at my grandads I need something radio related. So this week as its payday I’ve ordered some parts to get my own APRS tracker up and running. I’ll get some photos when parts other than the radio arrive. сондажиSo, I’ve done the major work quicker than I thought would take me. 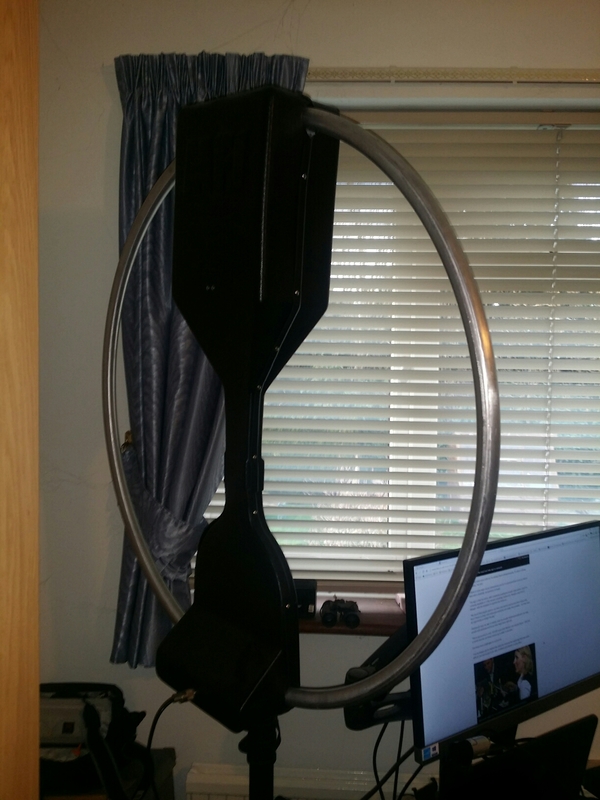 Also you might notice the MagLoop above which is now in place, and ready to use. It's been 14 years, 8 months, 0 weeks, 2 days, 3 hours and 23 minutes since I gave up smoking. I've not smoked 45875 Cigarettes nor spent £15,253.44. EXC.